Castle of Brothers of the Sword in Riga was built after ceremonial lay of foudning stone of Riga in 1201, at the lower reaches of Ridzene River, next to I court of bishop. This was the first and the last time when castles of both powers shared a wall. It is not precisely known when was constructed this castle. It was first mentioned in 1209 in connection to the case when brother of order Vikbert killed master Venno. After the murder Vikbert escaped from the residential part to chapel of the castle - later church devoted to St.George (St.Georgi, St.Urian, Sv.Juris). This chapel has given a name to whole castle often used in medieval times - castle of St.George, court of St.George. In 1215, when there was the first big fire in Riga and burned down the first Dom church, St.George church and castle were not damaged. This could testify that there were stone buildings. In 1225 papal legate Wilhelm from Modena consecrated chapel of St.George again. Starting from 1226 this chapel is called - church. View from the tower of St.Peter's church to court of Convent - location of the I Order castle. Soon after the construction of their neighboring castles Order and Bishop started conflict. After long strife in 1297 Rigans took the castle of Order and demolished it. This event was mentioned in the disputes between both sides for centuries to come. As far as it is known, church of St.George was not totally demolished. 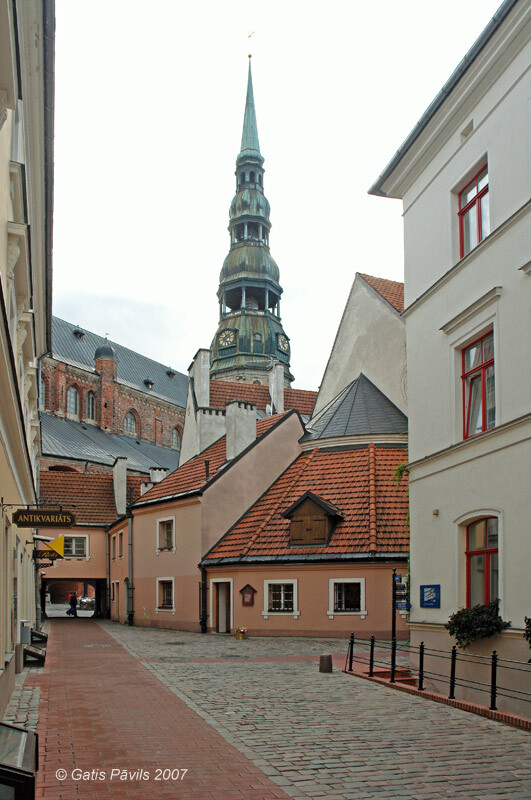 In 1304 bishop of Lund Isarnus settled dispute between Riga Archbishop and Livonian Order - there was set that Order will build a wall - 6 cubits high - between the town and house of order. In the wall there had to be left only one gate - 4 feet wide and 6 feet high It is not know whether this was accomplished. After 1330 as the master Everhard von Monheim started to construct new castle at Daugava, in the area of old castle there was placed the medieval hospital established already by bishop Albert - Convent of St.Spirit. This hospital moved over here from the site of the new castle of Order. Church of St.George continued to exist now as church of St.Spirit. From late 15th century to 1554 the area of former castle was managed by Third Order (one of Catholic orders). After the reformation Council of Riga rented these properties as storehouses - this continued from 16th century to early 20th century. In some buildings there remained shelter and institutions of the Convent of Sacred Spirit. At the end of 17th century name "cloister" from the toponym was omitted and there was used name - "storehouses of St. Spirit". Nowadays popular name is Court of Convent - Konventa sēta. After the fire of 1689 buildings of the Convent of St.Spirit were transformed into four separate storehouses. In 1703 stonecutter Michael Merkley made four stone crowns which were immured in the walls of storehouses. In the middle of each crown there was attached figure of dove (symbol of Sacred Spirit) - in white, red, black and yellow color. Thus the rebuilt church of St.George became a Storehouse of White Dove. There were bricked up window openings of the church and it was divided in six low floors. Later church was partitioned in three storehouses - named respectively Blue, Brown and White dove storehouses. Only in 1879 J.Döring draw attention to the fact that these buildings are parts of semi-forgotten medieval church - at this time Riga city already planned to demolish these buildings and sell land plots for construction of new buildings. Thanks to the writings of K.Löwis of Menar the importance of this building in the history of Riga was recognised and project was terminated. Church of St.George was used as storehouse up to 1970ies. In 1983 - 1985 Polish restorers researched and restored church of St.George. In 1986 - 1989 these works were continued and here was located Museum of Decorative Applied Art. There were partly left storehouse ceilings from 17th century. Meanwhile other buildings of the Convent were reconstructed and rebuilt in 1990 - 1994 and now there is located hotel complex "Konventa sēta". Unfortunately before the start of construction the archaeological survey was not complete and we will never learn all what was possible to learn about the planning and location of buildings of the castle of Brothers of the Sword. Castle was located at the right bank of Ridzene river, in the centre of the new town, next to I court of bishop. Castle of Brothers of the Sword was the first citadel of Livonian knights and was formed as convent building in Romanic style - with inner yard, protective wall and at least three - four buildings along this wall. In the chronicle of Hermann de Wartberge regarding the events from 1297 there is mentioned that castle of Order had two towers. Area of castle took prolonged square with dimensions 95 x 63 metres. For the construction there was used local light dolostone and local inhabitants who were not used to stone buildings called it White (Whitestone) castle (Wittenstein) - although this most likely is invention of historians in later times. There are no sources supporting this hypothesis. Initially both the castles of Order and bishop were similar in size and planning. In the south-east of the castle area there was large medieval brick building - further information about it has been lost in the reconstruction of 1990ies. Chapel of St.George was located in south-western side - this building is mentioned in written sources already in 1209 and now this is the oldest stone building in Riga. It was transformed to church in 1225 - there were joined chapel and dining-hall. As the church was reconstructed in 1981 - 1988, there were uncovered Romanic window openings in the facade directed towards street. It has been found that over the time this church was rebuilt and increased. 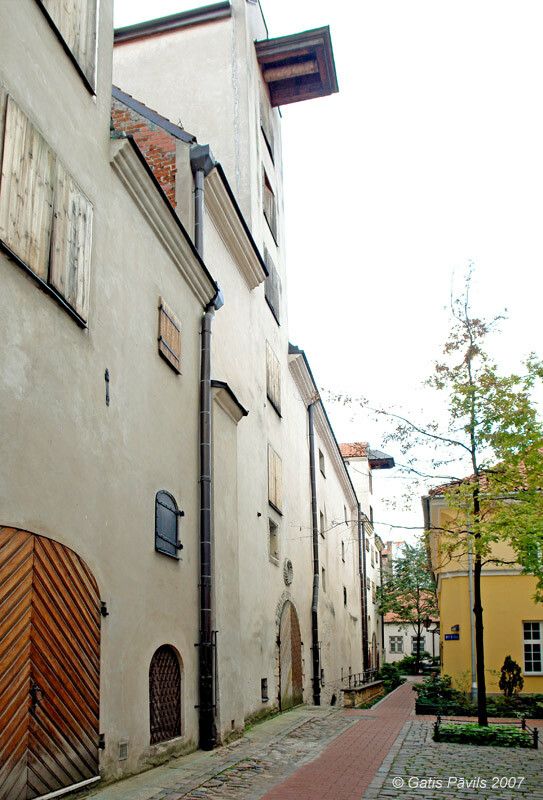 Fragments of the walls of the castle of Order are best seen from the Skarnu Street, in the side of Konventa seta there are seen later buildings and later architectonic styles. The oldest preserved building of Convent - Shelter of Grey Sisters (Block No.2., 1488, rebuilt in 1860) and Campenhausen poorhouse (1492.). There are legends and ghost stories connected to this castle. View from Konventa seta towards St.Peter's church. 2007.09.09. Latvijas piļu un muižu asociācijas mājaslapa, visited on 22nd June 2009. Caune A., Ose I. Latvijas 12.gadsimta beigu - 17.gadsimta vācu piļu leksikons. Rīga, Latvijas vēstures institūta apgāds, 2004, pp. 43.,398. 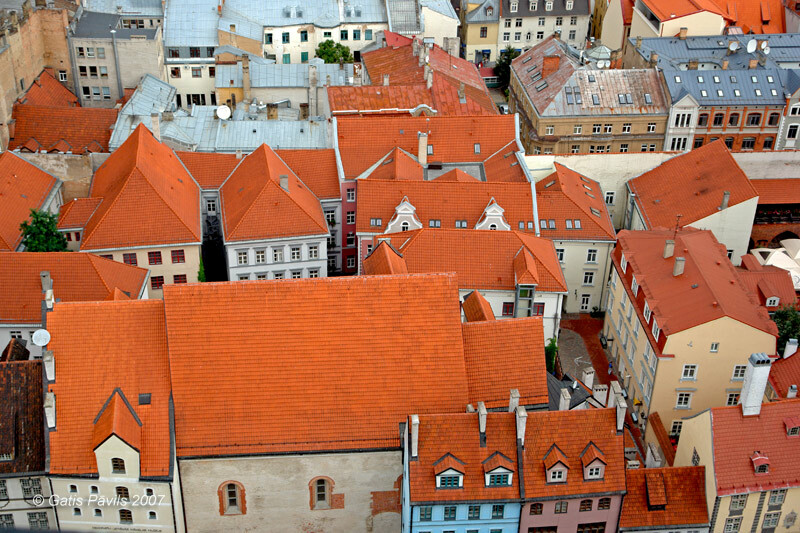 Krastiņš J., Strautmanis I. Lielais Rīgas arhitektūras ceļvedis. Rīga, Puse. p.30.